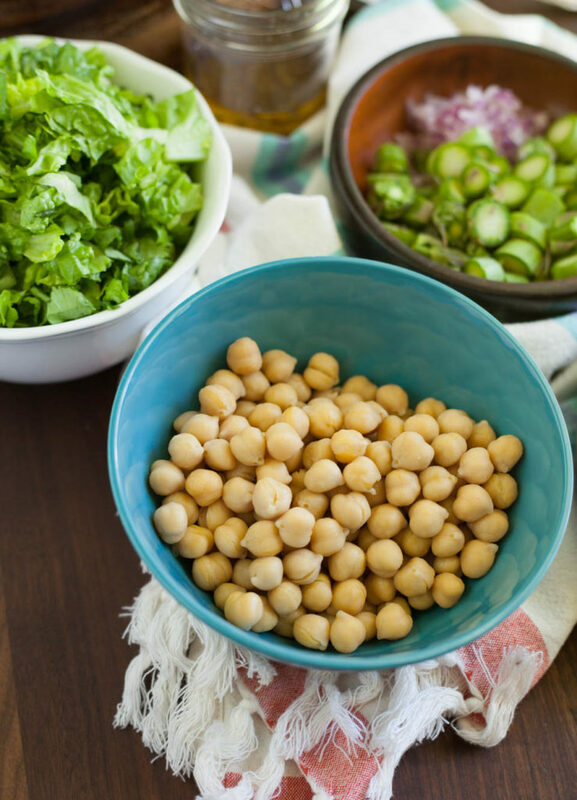 Spring Chickpea Salad with Honey Garlic Lime Vinaigrette is a perfect salad for weekday work lunches, family gatherings, or as a side dish to any great grilled chicken or fish. It’s almost our camping time here! We have favorite places to camp, always near creeks for the lovely ambience. And we always pack super awesome camping favorites with a salad in there somewhere. 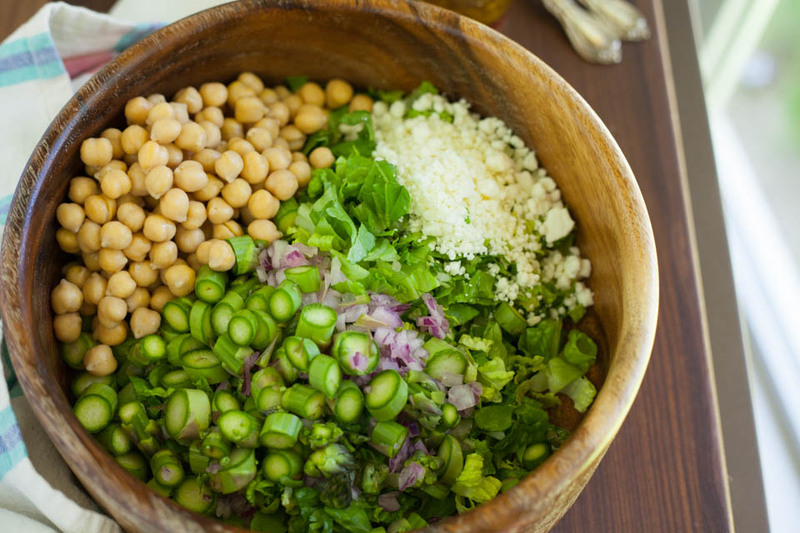 I’m all about making tons of different salads for every season, cold or hot. But you already know that about me! So I made an impromptu salad by the campfire and from that one came this recipe. That is often how recipes come to me, inspired by something I’ve made or eaten. 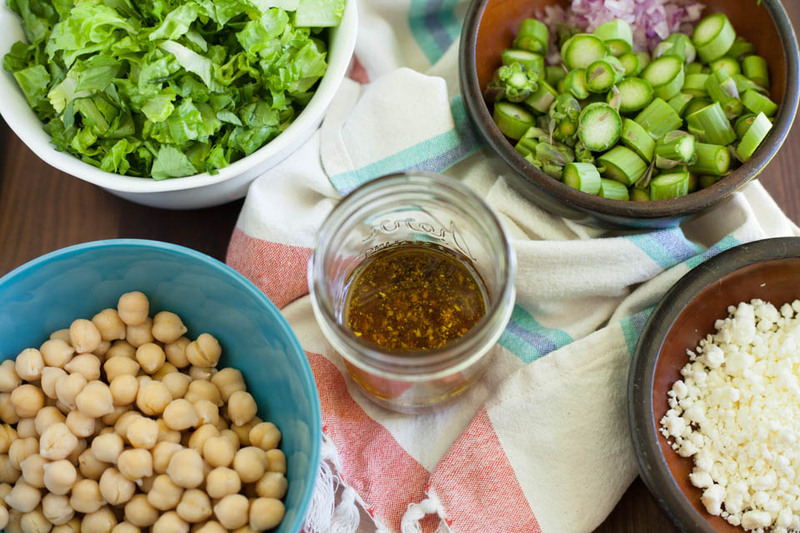 As soon as I got back I made this Spring Chickpea Salad with Honey Garlic Lime Vinaigrette a couple of different ways and landed on this recipe. We’ve made a pack to go camping about once a month to enjoy the outdoors, and I’ll totally be taking this one in our next adventure. Make this a day in advance for an even easier meal. Pack it for work week lunches, family bbq gatherings, just triple the recipes, or as a side dish with grilled chicken, fish, or pork. It’s super versatile and tasty! 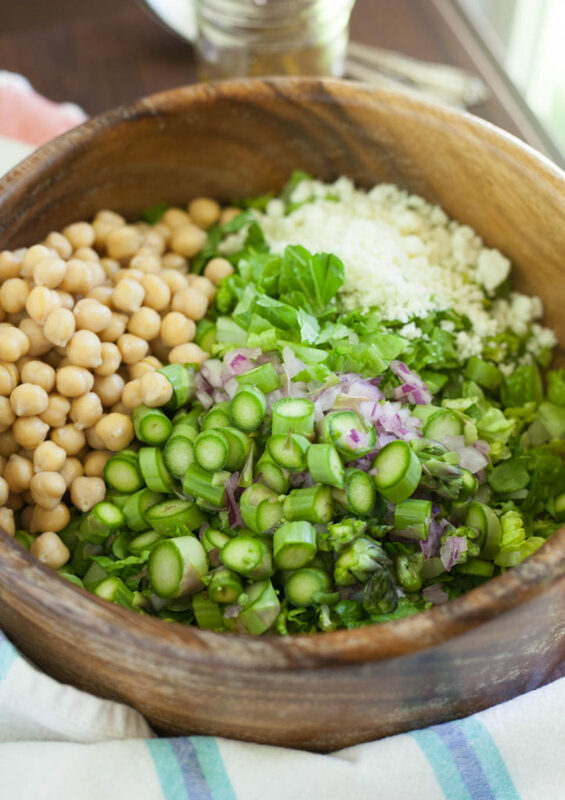 Place chickpeas, romaine, asparagus, shallots, and feta in a medium bowl. Gently mix to combine. Jar vinaigrette method: combine vinegar, lime juice, garlic, honey, olive oil, 1/8 teaspoon salt and pepper in a jar fitted with lid, shake vigorously until combined well, about 30 seconds. Add to salad immediately. Traditional vinaigrette whisk method: combine vinegar, lime juice, garlic, honey, olive oil, 1/8 teaspoon salt and pepper in a small bowl. To make easy, place bowl on a kitchen towel to prevent from moving. Very slowly drizzle olive oil in a steady drizzle while whisking, using a whisk, to emulsify. Add to salad immediately. Mix to combine. Taste for seasoning, add salt and pepper if needed. Serve immediately or store in an airtight container for up to 3 days.